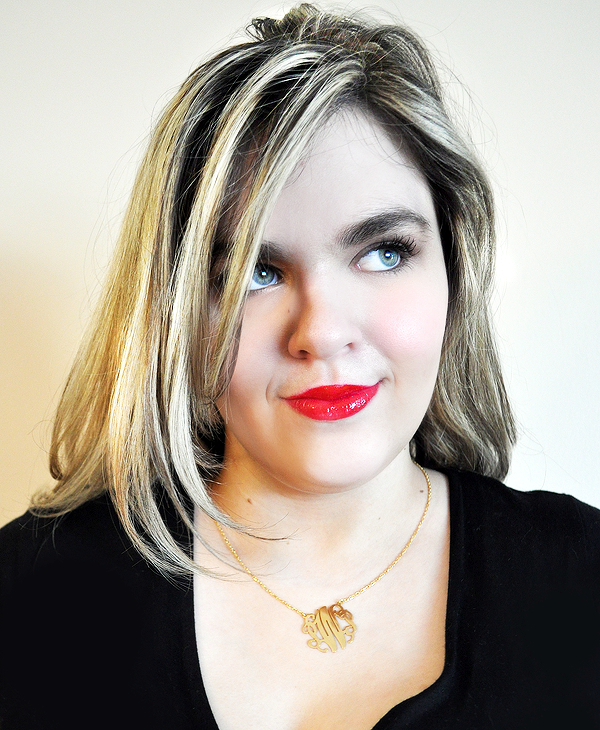 rose & pine: My Review of the Best Monogram Necklace... Ever. My Review of the Best Monogram Necklace... Ever. I am a jewelry addict, I really am. So when 9th & Elm contacted me to do a review on a piece of jewelry, I jumped at the chance. 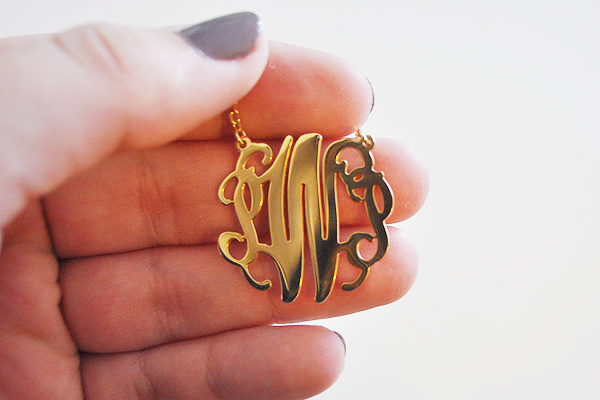 I picked the most stunning gold monogram necklace. I have actually wanted one of these for a while now, and I feel like it was fate that I reviewed it. 9th & Elm is the just cutest site that sells the best handmade and independent jewelry. After I made my order, it arrived in a little over a week, which I find amazing for a personalized product. It came in a tiny purple box with one of those cute ribbon roses and a little message. So much thought was put into the packaging, which is great for ordering as a gift for a friend. I got so excited when it arrived that I opened it while my mom was over, and she loved the necklace so much that she ordered one for herself and one as a birthday present for a friend. The necklace is 1.25 inches in height and length. It is 18K gold over silver and fully personalized! There is an option of four chain lengths to choose from, 16, 18, 20, or 22 inches. I ordered my necklace in the 18'' length. 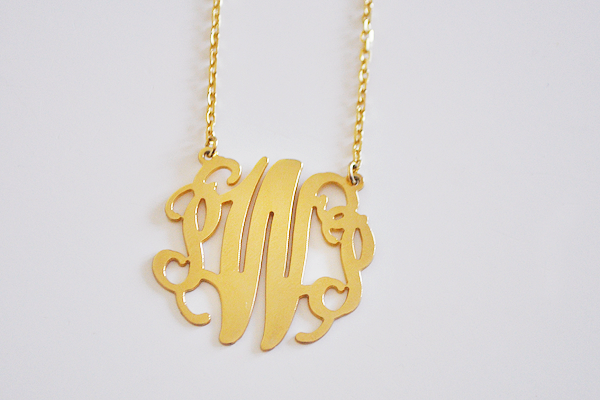 You can order your own personalized monogram necklace from 9th & Elm here. It is originally $65, but you can buy it today for $40! I am absolutely amazed by this necklace, it is so well made and looks so expensive, but it is under $50! I wore it to dinner at my favorite restaurant in downtown Newport the other night, and I got so many compliments! I paired it with a basic white blouse, blue jeans, and a new blue suede bag that made me look like I had a run-in with a smurf by the end of the night. 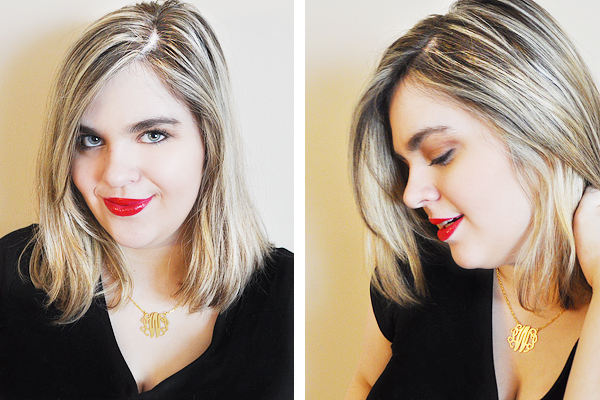 Make sure to check out my friends over at 9th & Elm, and take a look at their beautiful products, especially this fantastic gold monogram necklace that I am in love with! Have a great day, and stay safe if you are in the snow! This post was sponsored by 9th & Elm and contains affiliate links. I received this necklace for review purposes. All opinions are honest and my own. Thank you for supporting this blog and our sponsors! Ahh I love it! Such a classy, glamorous necklace! 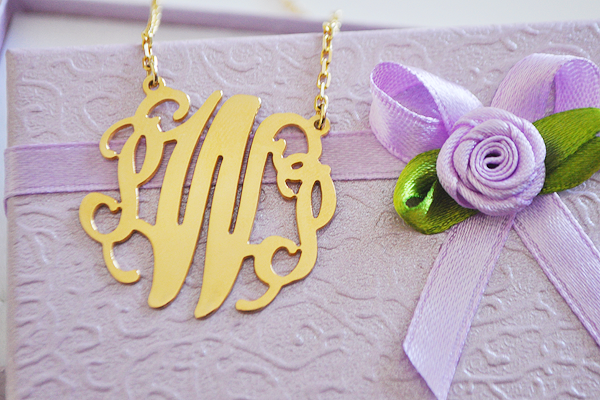 I've been lusting over these monogram necklaces as well.